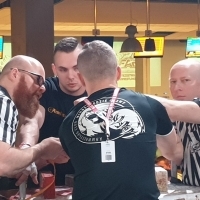 Half of the professional armwrestling table works perfectly with the regulated lift, especially when it comes to bicep or wrist exercises in a standing position. Pulldowns on regulated pulley with wrist supination. Elbow rested on half-table. Exercise targets arm power for over-the top technique. Arm should be kept close to body with this exercise. This move helps control chest muscles. Pulldowns to opposite shoulder, with wrist pronation. Targets forearm and chest to the maximum. Pronation imitates offensive fighting.